What better way is there to see our magnificent countryside than behind the wheel of one of our Hitop campervan hires. After a day’s driving you can pull up to your campsite, cook dinner and then sit back and relax, enjoy your meal whilst taking in one of New Zealand’s wicked sunsets in your Hitop campervan hire. At the end of the day, you retire to a comfortable double bed in the privacy of your own hotel room – on wheels! Rates include: Unlimited kilometers, 24 hour road side assistance, Standard Insurance, Free Camping guides and Maps. Vehicle is certified self-contained when hiring a porta potti for $50. Comet Campers opened in Sydney, Australia, in late 1993, at a time when there were already a number of dealers selling cars to backpackers. However, these businesses were car dealerships first and foremost and did not really understand the needs of travellers. From the outset, Comet Campers focused entirely on these special needs. As ex-backpackers, all of us decided to provide the kind of service we would expect ourselves. We opened our operations in New Zealand through our partners Escape Campers & Happy Campers in 2008. What you see today is the result. None of the car dealers that were selling to backpackers in 1993 still exist today! Comet Campers knows Australia & New Zealand inside out – it’s our home! We also know cars and love our job. Basically, the idea of travelling around Australia/New Zealand by bus is simply out of the question. This Agreement is made on the date specified on the Rental Agreement between Comet Campers and the Hirer. You are obliged to read this document thoroughly and ask for clarification of any points you do not understand. These Terms and Conditions do not restrict any rights or provisions applicable to you as a consumer as defined by New Zealand consumer laws. Further information is available from New Zealand Consumer Affairs and other consumer organisations. “Agreement” means the Rental Agreement and these Terms and Conditions. “New Zealand Consumer Law” means the Consumer Guarantees Act 1993 and Fair Trading Act (where applicable). “Consumer” means a consumer within the meaning of section 2 of the Consumer Guarantees Act 1993. “Hirer” means the person or persons nominated as the hirer, additional drivers and any person whose credit card is presented for payment or who is otherwise responsible for any payment associated with the rental or the security bond. “Comet Campers” means Comet Campers Limited. “Vehicle” means the initial Vehicle and any replacement Vehicle hired by the Hirer and includes all equipment, accessories, tyres, tools or any additional hire items. “We” means Comet Campers and “our” has a corresponding meaning. “You” means the Hirer under this Agreement and “your” has a corresponding meaning. NOTE: There is no refund for late pick-up or early return of Vehicle. Full balance of payment (including the deposit) will be collected at the time of confirmation if you have elected to process your booking in a currency different to NZD. The balance is payable 38 days prior to pick up (unless otherwise paid for upon confirmation of booking, then 'other fees payable locally upon arrival will still need to be paid). Comet Campers accepts Visa, MasterCard and American Express. Visa and Mastercard will incur an additional non-refundable 2.2% surcharge on any transaction. American Express will incur an additional non-refundable 5% surcharge on any transaction. If your overseas debit or credit card has been charged in your home currency, the foreign exchange conversion rate applied is the exchange rate applied by Comet Campers merchant supplier at the time the transaction is processed. Due to exchange rate fluctuations, there could be some variance in the amounts charged or refunded compared to the amount initially charged. You irrevocably agree to release Comet Campers from any liability for such variation. Comet Campers is entitled to retain the Hirer’s credit card details in accordance with the Payment Card Industry – Data Security Standard and take any action necessary to recover from the Hirer’s credit card all amounts due by the Hirer pursuant to this Agreement, including any amounts due in respect of damage to the Vehicle or property of a third party and all additional charges as set out in this Agreement. 1) The Vehicle is delivered to you in good operating condition. Subject to your rights under this Agreement, you agree to return the Vehicle in the same condition (except for ordinary wear and tear, not including windscreen or tyre damage) together with all tools, tyres, accessories and equipment to the location specified in the Rental Agreement and on the date there specified (or sooner, if demanded by Comet Campers). 2) Vehicle pick ups are available anytime between 9:00 am and 4:00 pm Monday to Friday, and between 9:00 am and 12:00 pm on Saturdays. Vehicle drop-offs must be before 3:00 pm Monday to Friday and before 12:30 pm Saturday. No pick ups or drop offs are provided on Sundays and public holidays. 3) Please note that our branches are subject to shortened low season opening hours. These hours are 9:00 am to 4:00 pm weekdays and closed Saturday and Sunday. Low season is from 1st May to 31st August. 4) There is no refund for late pick-up or early return of a Vehicle. Hirers are charged for the length of time booked, not the actual time used. We strongly recommend that all Hirers take out their own premium travel insurance in respect of the risk that a Hirer, for reasons of their own, may need to return a Vehicle earlier than expected. 5) A 59 minute grace period after the return time stated on the Rental Agreement applies to all rentals, should the Vehicle not be returned within the grace period a $250 fee applies. Vehicles overdue may also incur an additional $250 fee per day and be reported to the police as stolen. 1) Any change of return location can only be authorised by Comet Campers Central Reservations and depends solely on future bookings and availability. The change of drop off location is not confirmed as approved until after the change of location fee has been accepted, paid and you have received written confirmation. Please note; a casual conversation with a Comet Campers staff member does not constitute authorisation. An approved change of location may attract a fee to a maximum of $500. Please communicate all change of Drop off location requests by calling Central Reservations on the Customer Assistance Line at the earliest possible opportunity as all requests are subject to availability. 2) Any unauthorised change/s of location drop off will see the Hirer responsible for the entire cost of relocating the Vehicle to its intended location plus any hire fees that are foregone by Comet Campers by reason of the Vehicle being unavailable for subsequent hire at the agreed drop off location. 1) For all Vehicles, day one of the rental period is the day of pick up, regardless of the time, and the day the Vehicle is returned is counted as the final day also regardless of the time. 2) The minimum rental period is 5 days for all Vehicles (same city return). One way rentals have different minimum rental periods between 10 and 35 days. 3) A one-way fee may apply; this fee may vary according to location, seasonality and length of booking. 4) All Vehicles have unlimited kilometres included in the price. 5) Rates are in New Zealand Dollars and are inclusive of GST. 1) If you, the Hirer, wish to extend the rental whilst the Vehicle is for hire, you must first obtain written authorisation from Comet Campers’s Central Reservations. A casual conversation on the topic with a Comet Campers staff branch member does not constitute authorisation. Your requested extension is not authorised until it is expressly approved and confirmed in writing, and you have nominated a specific date and the extension has been paid in full. Calling a day or two before you are due to drop off and requesting an extension may result in your request being rejected owing to future bookings of your Vehicle. Please communicate all extension requests by calling Central Reservations on the Customer Assistance Line at the earliest possible opportunity as all requests are subject to availability. 2) No refunds will be given for any booking amendments to the rental dates within 31 days of collection (if the length of hire is shortened) and the rental will be charged at the number of days originally booked. A relocation fee may apply if the collection or return location is amended within 31 days of Vehicle pick-up. 3) A $25 change of booking fee applies for any changes to your booking within 31 days of the date of pick-up. No fees apply for any changes to your bookings outside of 31 days of the date of pick-up. 1) Comet Campers reserves the right to substitute a comparable or superior Vehicle at no extra cost where unforeseen circumstances dictate. This shall not constitute a breach of contract and shall not entitle you to any refund. 2) Should you decide to downgrade your Vehicle from that originally booked you will not be entitled to any refund. 1) Comet Campers reserves the right to refuse any rental at our discretion. 2) Comet Campers may take possession of the Vehicle without prior demand and at your expense, if it is illegally parked, used in violation of the law, or if any term of this Agreement is breached or if the Vehicle is apparently abandoned. 1) A valid full driver’s licence (state, national or international) is required for each nominated Hirer and must be presented at the time of the rental. 2) If the driver’s licence is not written in English then an international driver’s licence will also be required. An accredited English translation will be accepted in lieu of an international driving licence. The translation must be provided by an NZ Transport Agency authorised translator, diplomatic representative or the authority that issued the original overseas licence. 3) A fee of $3 per day per extra driver is applicable and payable on pick up. Fees are payable up to a maximum of $75 (25 days), thereafter no fees apply. Up to 2 additional drivers are allowed. All additional drivers must be noted and must sign the Rental Agreement in person at a Comet Campers branch. All drivers, which join mid-rental, are required to pay the appropriate Extra Driver fee for the full amount of all rental days of the booking. 4) Only those individuals who are named and are signatories to the Rental Agreement are authorised to drive the Vehicle. 1) The minimum age for all drivers is 18 years. 2) The maximum age for all drivers is 75 years. 2.2) To propel or tow any Vehicle, trailer, boat or other objects unless Comet Campers has authorized such use in writing. 3) The Hirer acknowledges that Comet Campers retains title to the Vehicle at all times. The Hirer shall not agree, attempt, offer or purport to sell, assign, sub-let, lend, pledge, mortgage, let on hire or otherwise part with or attempt to part with the personal possession of or otherwise deal with the Vehicle. 4) Smoking, the carriage of pets or other animals, and/or use of candles or mosquito coils are expressly prohibited. Registered Guide dogs excepted. 1) A fee of $7 per day applies for the hire of a GPS unit. Fees are payable up to a maximum of 20 days, thereafter no fees apply (maximum $140). 2) A fee of $10 per day applies for the hire of a Tablet. Fees are payable up to a maximum of 15 days, thereafter no fees apply (maximum $150). 3) The Hirer will be liable up to a maximum charge of $250 should the GPS unit or tablet, mount, charger or carry case be lost, missing or damaged during the rental. The Hirer must also ensure due care is taken with the GPS unit or tablet ensuring that it is kept protected and out of sight while the Vehicle is unattended. The Hirer must also follow all usage and safety guidelines provided by the manufacturer of the GPS unit or tablet and Comet Campers. 3) Comet Campers is not responsible for any harm, damage, loss (including consequential loss) or misadventure that occurs as a result of the use of the GPS unit or tablet. 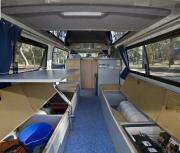 All campervans are provided with a self-contained certificate. To take advantage of the certificate a $50 fee applies on pick-up which entitles you to a porta potty (portable toilet). Please note without the porta potty the certificate will not be valid. You must ensure that the porta potty is emptied and clean prior to returning the vehicle otherwise a charge of $150 will apply. All campervans will be supplied with living equipment (such as bedding, cooking equipment, cutlery, bath and tea towels), for a fee of $45. 1) New Zealand child restraint law stipulates that all children under the age of 7 years old must be properly restrained in an approved child restraint. 2) For children aged 4-7 years inclusive, a booster seat can be supplied for a one-time fee of $45 which is suitable for use in all Vehicles. 3) The supply of all child restraints is subject to availability and fitting of the restraints remains the sole responsibility of the Hirer. 1) A non-refundable $75 processing fee will be charged per infringement, toll notice or offence to cover processing costs in relation to any speeding, parking fine, traffic infringement, toll notice or Freedom Camping offences. 2) Comet Campers will send you (including by way of email) a copy of the relevant infringement or fine notice and any reminder notice as soon as practicable after receipt thereof by Comet Campers. 3) The Hirer agrees that we may pass your credit card and any other relevant personal details in relation to the rental of the Vehicle to a third party sub-contractor for the purposes of contacting you directly regarding processing and/or payment and/or recovery of penalties or fines due or becoming due under any infringement or fine notices received by Comet Campers in connection with your use of the Vehicle. 4) All enquiries in relation to infringements and notices should be forwarded to the contact details outlined on the relevant traffic and/or toll infringement notice. You will retain all rights to query, challenge or object to the authority that issued the infringement notice or to a court within the timeframe stipulated on that notice (details should be provided on the infringement notice or fine). 5) The Hirer remains liable for the payment of the original fine or toll. 1) Vehicles may only be driven on sealed roads/bitumen roads or well-maintained access roads less than 500 metres long to recognised campgrounds and parking areas. Travel on unsealed roads voids any waiver of liability under clause Security Bond / Liability Options of this Agreement and renders the Hirer liable in accordance with clause Exclusions of this Agreement for the total cost of any Damage that is caused or contributed to by reason of travelling or having travelled, on unsealed roads. 2) The Hirer releases and indemnifies Comet Campers in accordance with clause Exclusions of this Agreement from and against all actions, claims, demands, losses, damages, costs, expenses, harm or other misadventure which the Hirer may suffer or incur or for which the Hirer may become liable as a consequence of any use of the Vehicle on unsealed roads. 3) Comet Campers reserves the right at its sole discretion to restrict Vehicle movements in certain areas due to adverse road or weather conditions. 4) All Comet Campers Vehicles are not permitted on Ninety Mile Breach (Northland), Skippers Road (Queenstown), Crown Range Road (Queenstown), Ball Hut Road (Mt Cook) or the Coromandel Peninsula North of Colville Township. Vehicles are also not permitted on all ski field access roads between 1st June and 31st October. (Unauthorised travel will void any waiver of liability under clause Security Bond / Liability Options of this Agreement and renders the Hirer liable in accordance with clause Exclusions of this Agreement. The Hirer will also be responsible for all costs associated with the rental, including servicing, breakdown and recovery as well as loss of bond). 5) If Comet Campers has reason to believe that your Vehicle may have been driven on unsealed roads the Vehicle bond will be retained until a complete inspection of the Vehicle determines whether any damage has occurred. The Hirer will be liable for any damage found. If it is determined that the Vehicle has been off-road but no damage is evident you will still be charged $250 for breach of duty. 1) AUTO CLUB 24 Hour Road Side Assistance service is provided. Only after Roadside Assistance has assessed the Vehicle should you call Comet Campers. Please note that call outs from Roadside Assistance due to the Hirer’s error or non-mechanical issues such as running out of petrol, flat battery resulting from leaving lights/engine on, keys locked in Vehicle will result in a charge of $165 to the Hirer payable directly to the Road Side Assistance, note this fee is not refundable to the Hirer by Comet Campers. 2) COMET CAMPERS ON-ROAD ASSISTANCE. Comet Campers provides a Customer Assistance Line contact number. 3) COMET CAMPERS CUSTOMER ASSISTANCE LINE is available If you have any questions at all during your rental. This service operates 09:00 to 18:00 Monday to Saturday and 11:00 to 15:00 on Sundays and Public Holidays. 4) WEEKEND & PUBLIC HOLIDAY LIMITED SERVICE - The Comet Campers CUSTOMER ASSISTANCE TELEPHONE LINE is offered as a courtesy to Hirers who may find themselves in desperate need of our support. On weekends, most support services such as mechanical garages, etc are closed and therefore limited help is available, in any case. 5) Please restrict weekend calls to the CUSTOMER ASSISTANCE LINE to EMERGENCY CALLS ONLY. 6) If your call relates to administration, extensions, accounts enquiries, etc or minor mechanical issues please call Monday to Friday 09:00 to 17:00. 7) Comet Campers does not offer a 24/7 customer assistance line. 1) Comet Campers Vehicles are maintained and serviced to a high standard, however, this does not prevent the occasional mechanical malfunction. Minor repairs of a mechanical nature costing less than $100 may be effected without our authorisation and will be reimbursed upon completion of the rental if tax invoices are produced. 2) If you experience any problems, even minor, you must ring the Customer Assistance Line for further assistance and advice. For amounts over $100, Comet Campers must be informed and our approval must be sought and obtained before undertaking repairs. We will usually approve repairs provided the Hirer was not directly responsible for the damage, but reserve the right to approve or decline repairs on a case by case basis. Tax invoices must be submitted or the claim will not be paid. 3) In all cases, the responsibility of Comet Campers is limited to refunding the time that the Vehicle was actually in repair. This can be in the form of a rental extension or refund of hire fees. No alternative accommodation, travel costs or food items will be paid during downtime. Replacement Vehicles will not be supplied. 4) Our responsibility to provide a rental extension or refund of hire fees is conditional on any problems associated with the Vehicle, including equipment failure, being reported to Comet Campers as soon as possible and within 24hrs in order to give Comet Campers the opportunity to rectify the problem. 5) Malfunctions of stereo systems, cabin lights, air-conditioning, fridges, microwaves, sink water pumps etc., are not considered mechanical breakdowns and downtime will not be paid. 6) Comet Campers does not accept responsibility for towing and retrieval of accident damaged Vehicles. 1) For your convenience, the fuel tank is full on pick up and should be returned full by the Hirer. The charge for re-filling is $2 per litre plus $50. This covers the additional labour time taken to refill the Vehicle. Fuel receipts must be produced on the return of the Vehicle to show that you have refilled the Vehicle within 10KMs of return location. IMPORTANT – OIL & WATER LEVELS The Hirer is responsible for checking, at least daily, and to maintain all fluid levels and immediately to rectify and report to Comet Campers by calling the Customer Assistance Line any defect of which you become aware, however slight. Topping up a Vehicle that is losing water somehow is not rectifying the problem. Rectification means a fit and proper diagnosis and repair. Comet Campers cannot stress enough your responsibility in this regard. Continued operation of the Vehicle after a defect has occurred may lead to serious consequential damage to the engine for which you may be held responsible under clause Exclusions of this Agreement. We cannot stress enough the risks of continued driving if your car begins to overheat, or if it has a known cooling system problem of any kind. If your temperature gauge moves in a direction that is a departure from normal, stop immediately, investigate and call Comet Campers on the Customer Assistance Line. Do NOT wait for it to cool and drive again as you may cause further catastrophic damage to your engine, for which you WILL be liable. Driving with an inoperative temperature gauge voids any waiver of liability by Comet Campers and may result in the Hirer being held liable if overheating occurs. Regardless of any agreed waiver of liability by Comet Campers, the Hirer remains fully responsible for any damage caused as a result of driving or immersing the Vehicle in water. 1) The Hirer acknowledges that Comet Campers holds a contract of insurance (“Our Policy”) for accidental damage to the Vehicle or legal liability for loss and damage to property belonging to others caused by or arising out of the use of the Vehicle (“Damage”). 2.1) the amount of any applicable bond that is payable by Comet Campers in respect of any Damage that is incurred while the Vehicle is in the Hirer’s possession, and for which Comet Campers has not agreed to waive the Hirer’s responsibility. 2.2.2) any Damage that is incurred while the Vehicle is in the Hirer’s possession if the Hirer breaches any term of this Agreement and the breach is the cause of, or contributes to, the Damage. 2.3) subject to clause Exclusions of this Agreement, administration costs and the cost of demurrage for any period in which the Vehicle is unavailable due to repairs. 3) A VALID VISA OR MASTERCARD CREDIT CARD IS REQUIRED FOR THE SECURITY BOND. If you do not have a valid Visa Card or Mastercard please contact us so that we can email you a credit card authorisation form which allows you to use the credit card of a family member/guarantor. 4) A security bond is required upon pick-up of the Vehicle. The amount of the security bond is determined by the applicable liability option you have chosen. Payment of the bond is only accepted by a signed credit card pre-authorisation (sufficient funds must be available). The amount of the bond will not be debited from your account at this time. 5) If there is damage to the Vehicle on its return, the bond will be used to cover the cost of such damage up to the amount of the Hirer’s liability. If the damage is a consequence of a breach of any term of this Agreement and the bond is insufficient to cover the damage, then any extra cost will be charged. 6) Reminder: It is one bond per accident/damage and not per rental, therefore once you report the accident to Comet Campers, another bond will need to be pre-authorised, otherwise you cannot continue with the rental. 7) Accidents and any other damage must be reported to the Customer Assistance Line within 24 hours of the occurrence or all liability limitations and coverages are void. 1.1) Damage caused where the Hirer has breached the terms of this Agreement and the breach has contributed to the Damage. 1.2) Damage caused due to use of the Vehicle in contravention of clause Use of the Vehicle, Road Restrictions and Island Trips or Fuel and Fluids of this Agreement. 1.3) Damage caused to the Vehicle by not driving in a prudent and cautious manner. 1.4) Damage caused to the Vehicle by driving on unsealed roads or beach driving. 1.5) Damage caused to the Vehicle in any way by part or total water submersion including in flood water, river water, salt water, or any other source of water. 1.6) Damage caused to the Vehicle due to a single Vehicle write off or rollover. 1.7) Damage caused to the Vehicle by the Hirer’s wilful conduct e.g. sitting or standing on the bonnet or roof of the Vehicle. 1.8) Damage caused to the Vehicle by the Hirer using the Vehicle in contravention of any legislation or regulation controlling vehicular traffic. 1.9) Damage caused to the interior of the Vehicle regardless of cause when no other vehicle is involved. 1.10) Damage caused to the Vehicle due to the use of incorrect or contaminated fuel. 1.11) Damage caused due to the use or misuse of snow chains. 1.12) Damage or loss caused to any personal belongings. 1.13) Damage to the awning, overhead (roof) or under-body of the Vehicle. 1.14) Damage caused to the Vehicle because the Hirer has failed to maintain all fluid and fuel levels or failed to immediately rectify or report to us any defect of which you become aware. 1.15) All costs to replace keys which have become lost, broken, damaged, stolen or of retrieval of keys which been locked in the Vehicle, or where the Vehicle has been stolen due to it being unlocked. 1.16) Damage caused where the Hirer is deemed by local authorities to have been careless or willful in failing to abide by the local road rules, resulting in Damage to the hired Vehicle and/or Third Party Vehicle or property. 1.18) It is agreed between Comet Campers and the Hirer that section 11 of the Insurance Law Reform Act 1977 shall apply with respect to the above exclusions as if this clause constitutes a contract of insurance. 2.2) any damage or loss caused to any personal belongings within the Vehicle. 3) The Hirer is not liable to Comet Campers for, and does not indemnify Comet Campers in respect of, any Damage or loss to the extent that such Damage or loss is caused by any breach of this Agreement by Comet Campers, or by any willful or negligent act or omission of Comet Campers, its employees or agents. 4) This clause Exclusions and clause Property Damage of this Agreement shall survive the termination of this Agreement. 1) All rental charges specified on the Rental Agreement. 2) All charges claimed from Comet Campers in respect of parking or any other traffic violations incurred during the period of hire or until such later time as the Vehicle is returned to Comet Campers. 3) All loss or damage to the Vehicle, legal expenses, assessment fees, towing and recovery, consequential third party damage, storage and loss of use, where any such charges are incurred by reason of your breach of any term of this Agreement, together with Comet Campers’s reasonable service charges. 4) Where the Rental Agreement is comprised of more than one Hirer all Hirers are jointly and severally responsible under this Agreement. 1) You will within 24 hours report any incident involving loss or damage to the Vehicle or other loss or damage involving the Vehicle while hired under this Agreement to the Comet Campers location where the Vehicle was hired and will deliver to Comet Campers immediately, every summons, complaint or paper in relation to such loss or damage. Compliance with this sub–paragraph does not excuse the Hirer from reporting all incidents to the police or other proper authorities. 2) You release and hold harmless Comet Campers (and it agents and employees) from all claims for loss or damage to your personal property, or to any other person’s property that is left in the Vehicle, or which is received, handled or stored by Comet Campers at any time before, during or after this rental period whether due to Traveller’s Autobarn’s negligence or otherwise. 3) Except as provided by law no driver or passenger in the Vehicle shall be or deemed to be the agent, servant or employee of Comet Campers in any manner for any purpose whatsoever. 4) Except to the extent that the Consumer Guarantees Act 1993 may deem or require otherwise, Comet Campers gives no express or implied warranty as to any matter whatsoever including without limitation the condition of the vehicle and equipment, its merchantability or fitness for any particular purpose. 5) No right of Comet Campers under this Agreement may be waived except in writing by an officer of Comet Campers. If an officer of Comet Campers waives a right we may have this does not mean that those rights will be automatically waived on any other occasion. 6) Words used in this Agreement to denote any gender shall include all genders, singular words include the plural. 7) This Agreement constitutes the entire agreement between the parties and there are no other oral undertakings, oral representations, warranties or agreement between the parties relating to the subject matter of this Agreement that has been relied upon by the Hirer. 8) To the extent that any clause or part of any clause is in any way unenforceable, invalid or illegal, it is to be read down so as to be enforceable, valid and legal. In the event that this is not possible, the clause (or where possible, the offending part) is to be severed from this Agreement without affecting the enforceability, validity or legality of the remaining clauses (or parts of those clauses as the case may be) which will continue in full force and effect. 9) All charges and expenses payable by the Hirer under this Agreement are due on demand by Comet Campers including any collections costs and reasonable legal fees incurred by Comet Campers. 10) The Hirer must not assign or novate this Agreement or any rights or obligations under this Agreement without the written consent of Comet Campers. The Hirer authorises Comet Campers to sub-contract the provision of any of the services under this Agreement as Comet Campers may require in its absolute discretion from time to time. A ‘relocation’ is a necessary vehicle movement between branches to satisfy the needs of full fee paying reservations. Comet Campers will offer a ‘relocation’ Vehicle at a heavily discounted rate but will do so over the strictest of short periods such as to cover the transport needs of the Vehicle movement. Should you wish to travel for longer periods or desire more freedom with your Vehicle, we highly recommend you inquire about Comet Campers’s very competitive rental rates. 1) The rental of relocation Vehicles is subject to the standard Terms & Conditions of Comet Campers. 2) Relocations must be delivered in the set days we outline and may be offered from as little as $1.00 per day. 3) A minimum $200 cancellation fee applies for any confirmed relocation bookings which are cancelled or if the Vehicle is not collected on the date agreed. 4) Any late deliveries will incur penalties of $500 per day. There is a reason for the relocation. Usually, it is being moved to fulfil a full fare paying reservation. 5) Any request to extend relocations will be considered subject to availability, and if approved will be charged at the standard daily rental rate from day one. Minimum rental periods may also apply. (ii) cause any term of this Agreement to be void (“Non-excludable Obligation”). Except in relation to Non-excludable Obligations, all conditions, warranties, guarantees, rights, remedies, liabilities or other terms implied or conferred by statute, custom or the general law that impose any liability or obligation on Comet Campers are expressly excluded under this Agreement. 3.1.2) The aggregate of Traveller’s Autobarn’s liability to the Hirer is otherwise limited to an amount not exceeding the amount paid by the Hirer to rent the Vehicle. 3.2.2) in the case of goods, replacing the goods, supplying equivalent goods or repairing the goods, or payment of the cost of replacing the goods, supplying equivalent goods or having the goods repaired. 3.3) The limitation in above clause 3.2) of Traveller’s Autobarn’s liability for failure to comply with any Non-Excludable Obligation does not apply to any supply of goods or services of a kind ordinarily acquired for personal, domestic or household use or consumption. 4.1) In the event of an accident, where the Vehicle is no longer operational and no alternative Vehicle is available to the Hirer, our liability is limited to a refund of the hire charge or in the case of mechanical failure (unless caused by the Hirer) we may, at our election, supply a replacement vehicle for the remainder of the hire period. 4.2) In the event of an accident where the vehicle is no longer operational, it will be a matter of the discretion of Comet Campers whether to supply any alternative Vehicle. The Hirer acknowledges and agrees that if it has entered into this Agreement as a business, that as far as legally possible, the Consumer Guarantees Act 1993 does not apply to this Agreement or any product or service provided by Comet Campers. This clause Exclusion for hire ‘in trade’ will continue to apply even if this Agreement ends. 4) In the reasonable opinion of Comet Campers and/or the NZ Police, the driver of the Vehicle does not have sufficient skill or experience to operate the Vehicle in a safe manner or the safety of the passengers or the Vehicle is at risk. In such an event the Hirer will: (a) not be entitled to a refund of part of the rental charges; and (b) be responsible for the payment of any towing costs to return the Vehicle to the agreed return location. The termination of hire under this clause Breach of Contract/Termination shall be without prejudice to any rights of Comet Campers or the Hirer under this Agreement or otherwise at law. 1) The following terms have the meanings outlined in the Personal Property Securities Act 1999 (PPSR) – financing statement, interested person, register, proceeds, security agreement and security interest. 2.3) Comet Campers may perfect its security interest by lodging a financing statement on the PPSA register. 3) Comet Campers does not need to give the Hirer any notice under the PPSA (including a notice of a verification statement) unless the notice is required by the PPSA and cannot be excluded. 4) The Hirer will do anything reasonably required by Comet Campers to enable it to register its security interest, with the priority it requires, and to maintain the registration. Comet Campers will collect personal information about the Hirer as part of the rental process and the Hirer acknowledges that Comet Campers may not be able to perform this Agreement if all the information requested is not provided. Any information collected by Comet Campers will be handled in accordance with the requirements of the Privacy Act 1993 (the Act). The Hirer agrees that Comet Campers may collect, use and disclose the Hirer’s personal information through GPS tracking and diagnostics and other electronic tools in accordance with the Act. Under the Act, individuals have rights of access to, and correction of, their personal information. 1) If you are dissatisfied with your Comet Campers experience, you may raise a complaint with us. All complaints will be handled in accordance with our Dispute Resolution Process which you can view at here. This Agreement is governed by the laws of the New Zealand. The Hirer warrants that all information supplied by the Hirer to Comet Campers in connection with this Agreement is true.